Today Steven William Prestwich was laid to rest. He was the drummer in on of Australias most iconic rock bands,Cold Chisel. But he was also my dearly loved friend of over 35 years. Your war is over Steve,on this earthly plane. Rock on in Heaven mate.....I shall miss you more than you could ever know! Goodbye for now,my Little Zac! Because I had been concentrating on nursing and trying to save a 4wk old kitten most of Wednesday(March 25th) and all Thursday night(March 26th)..I didn't notice Zaccy my Black Miniature cat wasn't around or coming when called at dinnertime.I'd seen him eat his dinner very late Wednesday night(around 11p.m. )..then I suppose I concentrated on the little kitten,which was struggling..giving it most of my attention. At first,I thought Zac was probably just curled up asleep somewhere,he was very good at hiding when he wanted to! As time went on though,I became,more and more worried. This little guy hated leaving my room,let alone going further afield.Something definitely felt "wrong"! I went searching everywhere for him,there was a small hole he could have gotten out,but I did actually for some reason have a feeling of foreboding.When at 2am in the morning I came inside after going out with the torch to search the yard and street for him all to no avail....I just knew I couldn't give up looking for him,something pressed me on! Exhausted,I came inside and was ready to collapse into bed.....then, I made the discovery that chilled my blood and broke my heart.. There he was,right down the bottom of my bed.He was dead..he had been there on the TV,one of his favourite spots the night before.I thought it odd that he was letting his sister Tyra have his spot..or was not up to his usual tricks Such as,hiding behind the pc screen and waiting 'til I put my toast there,so he could pull it through,or using his "sunbed" my radio!Or sliding down the front of the computer screen,to come sit on my lap.....with little regard for any damage he may cause!But you had to forgive him immediately,he was so damn cute.....only had to look at you.He had quite a personality,yet a quite little lad,who liked to stay in the bedroom,"his room"near me,always.He was born there spent all his time there..apart from eating..and so sadly and tragically died there.I should have known. .....I think he wanted me to find him.....I'm sure of it! From what I can peice togrther poor little Zac had fallen off the TV as he did many times.Only this time he didn't clamber back up! immediately.He looked beautiful ,peaceful,calm,simply sleeping. Initially I thought perhaps he'd got the aerial cable caught around his neck,but if that were the case..being within 3' of him,surely I'd have heard..and it would still be there?! I believe being a miniature and so tiny, that he most probably had a congenital heart defect(he often breathed very heavily and made strange noises,was obviously delicate) and he'd had a heart attack in his sleep! I'm still in shock..It's hard to find words..
Apart from to give thanks for the time I had with this very special little cat,his love and friendship! I hope he was happy living with me,"Mama",because he gave me so much joy! Tomorrow,he will be buried alonside "Miffy",his great grandmother,Delia,his sister and The 4 little babies,who'd all passed. Zac I'm sad to lose the kittens.....but you,my precious darling,will be taking some of my heart with you! I hope it was fast and painless,but I know you have peace now.Hope I do one day.I wish I could have stopped this! I love you little boy,my heart is heavy and you will always be in it! Rest in Peace Zac.....and wait for me ,I'll be with you.Go and stay with Mum and Miffy until then! Bless you,beautiful little black boy! I think Zaccy died sometime on Thursday afternoon between 2p.m. and at the latest 8p.m......I tend to think it was around 2p.m. on Thursday March 26th.Bless his soul.My beautiful miniature boy! NO YOU WERE THE ONLY ONE OF YOU! A UNIQUE AND WONDERFUL FRIEND! SMALL IN STATURE,BUT HUGE IN EVERY OTHER WAY! MY LITTLE MAN~JOURNEY ON BABY AND HAVE PEACE FOREVER! LOVE YOU SO MUCH~THAT'S FOREVER! SOME THOUGHTS I HAD,AFTER WATCHING SOME VIDS ON HEPATITIS C! 30.10.09 I have decided I am going to beat Hepatitis C~I MUST! It will be hard I know! BUT, I MUST do the treatment. Statistics are 50/50 cure rate,even if the viral load isn't cleared completely but It'a a chance (Can hear Mum saying,"Where's there's life there's hope!") and it's true! Statistics also show that,the majority of people with it DONT KNOW they have it! Therefore,I am very lucky to know,and have options. Yes,it wont be easy..... BUT FAR PREFERABLE to finding out much too late..... As those who find themselves in that position,will NEED A TRANSPLANT! The next development if they cant,is the Big C! :( SO,I AM VERY,VERY LUCKY,to know now, AND I'M GOING TO WIN! OMG this song makes me melt! I lost my little girl Deliah tonight at about 10.40pm! My little girl was a kitten! She hadn't been ill,but was tinier than the boys(her sister and twin May had passed 2 weeks earlier) and would not chew as they would but only lap, although she did this with gusto,was very vocal about and nearly knocked me over when I'd bring in their warm milk! She was so beautiful in looks and nature,I felt closer to her than the boys,cos she had decided that I would be her Mama! She would climb up my leg to sit on my knee ANYTIME I sat down and each time I'd get into bed she'd toddle across the room and climb up into the bed,walk right up to my face and climb under the covers,where she'd sleep happily all night! She had to be closer to me than the boys and she let them know it! The last night we went to bed (1/8/09)she had seemed a little out of sorts,in that she didn't want her brothers to touch her,but not sick. When I awoke,I couldn't find her in her normal spot..on me! had seen her a little earlier further down the bed but thought nothing of it.Then I lay back and immediately felt her,but I didn't lay right back and I jumped up as soon as I felt her..I dont believe I injured her we had slept together every night. She toddled out of bed,but seemed wobbly and unaware of where she was going.I picked her up and her head wobbled from side to side. This filled me with dread as I have seen it in other kittens and it had always been imminent to their death! The toddling was the last time she would use her legs,she deteriorated very quickly,but was such a little fighter I'm sure she was trying to fight and hang on and I think she was doing it for me.Her little brother Ty sat with me next to her and cried,I took her to her mother Paris who licked her goodbye.Then I just sat with her in my lap monitoring her heartbeat and telling her all the things I loved about her and how much joy she'd brought to me! When she had tried too long,I told her,it was OK to go, just go to sleep and I'd be OK,her sister would be there and she'd be in a beautiful happy place forever! Whether you believe it or not,I believe she understood,for almost immediately,she looked straight at me,let out a very faint miaow (I believe Goodbye) and gave up fighting. I only had this little girl for 4 months,but she was very special(yes they all are and I have many animals)she made herself extra special,by showing complete trust and love,and letting it be known to all and sundry,that she had chosen me and only me! She made me feel special,cos she was special. 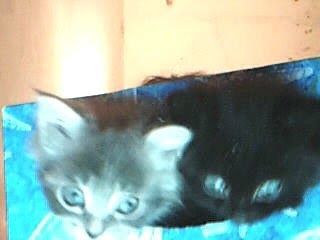 Strange that I had only posted a video the night before on YouTube of the kittens. I will be eternally grateful for the short time,I was privileged to have this little fluffy ball of love in my life and I wont ever forget her! Rest in that beautiful place,my little love,with all those I have loved and lost.It is my hope to join you all again sooner or later. It's so late,but I dont want to go to bed because I know,I wont feel her climb up and get into the bed anymore. This could affect your liver~Did Mine!